Stylish 1920s Solitaire Diamond Ring [SH8290] - £495.00 : loveVintageDiamonds.com, Your Vintage Diamond Dreams Come True! This is a neat solitaire diamond ring that would make a lovely engagement ring with a slightly less traditional look, or a really attractive dress ring. The diamond is collet-set which is then echoed in two further round surrounds which are very distinctively of the 1920s period. 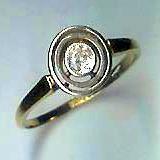 The ring is, in the most part, yellow gold, though the setting and surrounds are faced in white. The ring currently fits finger size 'K'/2' (UK). See our Ring Sizing page for details on complimentary ring sizing and an international sizing chart.